The photo was taken on our sailing holiday in Greece and show our approach to Porto Koufou, a small natural and very secluded port on the middle promontory of Chalkidiki in the north Aegean, called the Sithonia peninsula. The radio mast which wasn't indicated on the nautical charts is clear visible and so are the two harbour lights that mark the actual narrow entrance of this port. 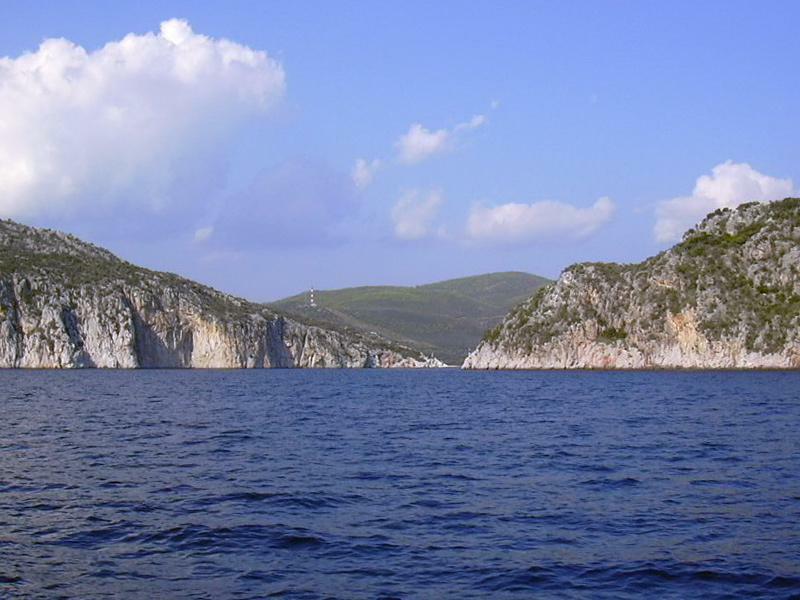 Porto-Koufou is ideal for making landfall when crossing from the Northern Sporades further south (about a long day sailing or motoring from Alonissos island of from Pelagos island). Another good option would have been Sikias port which is precisely at the opposite side of the Sithonia peninsula, yet a reef runs off the southern cape so more caution is necessary there. The eastern peninsula of Chalkidiki is called Athos and harbours Mount Athos, yet there are no safe ports here. When you visit these remote areas of Greece you will see what sailing Greece is all about: peaceful, quiet, blue and green, and small secluded ports and anchorages with just one yacht (your own) floating gentle in the best spot. Indeed most of the yacht charters here (from ports like Skiathos, Volos and Thessaloniki) are selfsail or bareboat. Only a minority opts for skippered yacht charters or even fully crewed charters.
.: Back to our logbook: sailing Greece :.